Sorry, we aren’t shipping this product to your region at this time. Chapter 6: Implications of empirical data: are pharmaceutical linkage regulations a success? 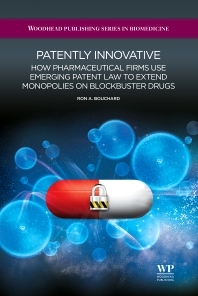 Patently innovative provides a review of the importance of traditional patent law and emerging linkage regulations for pharmaceutical products on the global stage, with a focus on the linkage regime in Canada. The primary focus is on how innovation in the pharmaceutical sector can be strongly regulated and how government regulation can either stimulate or inhibit development of breakthrough products. Dr Ron A. Bouchard is an intellectual property lawyer and scholar, specializing in the innovation, regulation, and litigation of biomedical products. His career has focused on the science, law, policy, regulation, and commercialization of medical technologies. He began his career as a medical scientist, completing a PhD and Postdoctoral Fellowship in the field of ion channel biophysics and Ca2+ imaging. He shifted focus to obtain a law degree specializing in pharmaceutical and biotechnology law and has been involved in the prosecution, acquisition, financing, distribution, and litigation of intellectual property rights. Dr Bouchard has appeared before the Federal Court of Canada and the Supreme Court of Canada. He has consulted with firms, universities, governments, and international organizations on legal, regulatory, and policy issues. He worked with the Government of Canada on its platforms for drug regulation and public private partnerships in technology commercialization. His research has been funded by federal and provincial funding agencies and private endowments. His scholarly expertise is focused on the intellectual property and regulatory aspects of therapeutic product development, including global aspects of technology commercialization, patenting, licensing, and regulatory approval, and empirical assessment of the impact of government stimulus packages and regulation on technology innovation. Dr Bouchard currently is involved with a new global consortium of scholars, physicians and economists studying the impact of emerging forms of patent law on the availability and costs of essential medications in developed and developing nations: the Consortium Study of Global Pharmaceutical Linkage.